I am pleased to introduce our guest blogger, Tiffani Frey. 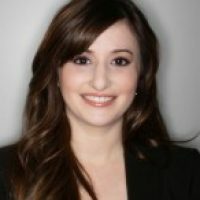 Tiffani Frey is a serial entrepreneur and marketing strategist with over 20 years in the trenches. When not chin deep in creating content for websites, blogs and email campaigns, and managing over 75 annual trade shows, she can be found hosting webinars, directing video shoots and composing music. An award-winning artist and equestrienne, Tiffani avidly pursues her passions which include painting, showing American Saddlebred horses in national competitions, reading, gardening, cooking and playing Halo. You can reach Tiffani through her blog at craftcreativemarketing.com. I want you to think back to your grade school crush. That one special boy or girl you couldn’t stop staring at. Everything they did was sigh-worthy. Their hair. The jokes they told. How they held their pencil. You doodled their name in your notebook (and if you’re a girl, you doodled your name followed by their last name). You wrote them love poems that you never gave them. You followed them home from what you thought was a discreet distance. You called and hung up before they could answer. Anyway… let’s talk about how a crush can benefit you. Facebook has revealed that on average, only 17% of your fans ever see your posts, and only 1-2% ever actually visit your page. ACK! When I first saw these numbers, I was pretty bummed. But then I thought about it for a minute and realized it’s just a matter of perspective. How many of your opt-in subscribers actually open your emails? How many click on your messages and get to your deeper content? How many website visitors fill out your lead form? Suddenly 17% didn’t seem all that unreasonable. But that doesn’t mean we should settle there! So let’s talk about how to improve that. First of all, we need to understand why only 17% of fans see our content – and why you need those embarrassing grade school crushes I made you relive moments ago (wasn’t that a fun trip down memory lane?). By default, Facebook sorts users’ newsfeeds by “most important.” What’s “most important” is determined by Edgerank, a proprietary algorithm comprised of Time Decay, Weight, and Affinity (check out my earlier blog post if you want an easy-to-understand explanation of Edgerank). Let’s dissect this screen shot of my newsfeed. I want you to ask yourself a few questions, taking the Edgerank formula into account. Are the posts sorted chronologically (i.e., most recent at the top)? 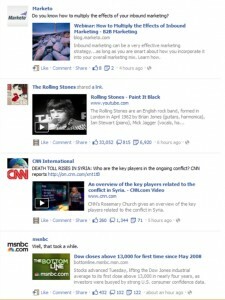 Are the posts sorted by activity (i.e., the ones with the most shares/likes/comments at the top)? Are the posts sorted by post type (i.e., videos and photos at the top)? Now, going back to the Edgerank algorithm, we know three things have an effect on the default newsfeed sort order: Time Decay, Weight, and Affinity. Time Decay says that the newer the post, the more points it gets. So shouldn’t newer posts float higher? Looking at the screen shot – that’s not happening. Weight says that posts with the most activity get the most points. So shouldn’t a post with 6,920 shares and over 33,000 likes above a post with only 2 shares and 8 likes? Hmmmm. Weight also says that videos get the most points. So shouldn’t the videos be on top? Hmmmm again. 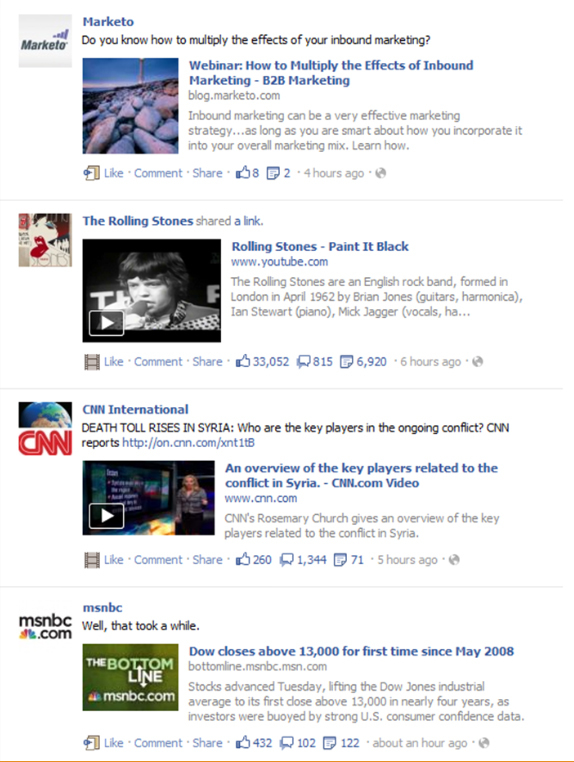 Why, then, is the Marketo post at the top of my newsfeed? It’s not the newest, it has the least amount of activity, and it’s a link to an outside website. The answer is simple: Affinity. That’s it! It seems so simple, doesn’t it? Wow. It really took me 607 words to get to that? Oh wait. You’re wondering how you make your stalkers visit your page, click on your posts, and share, comment, and like your posts? That’s simple, too. Just have cool hair and tell funny jokes! It worked in grade school! Interesting, relevant, and emotional content will garner attention. Attention will create action. And action drives Affinity. Strive for interesting, relevant and emotional b2b marketing content, of course always keeping Weight and Time Decay in mind, and you’ll see greater fan interaction on your posts. P.S. Crushes are one way. Affinity is also one way. Stalking your fans won’t get yourself into their newsfeed.